Our existing live application has ACRA thoroughly integrated already, with the formUri set to "http://OUR_SUBDOMAIN/acra/_design/acra-storage/_update/report". We would love to use Tracepot, and would definitely be paying customers as we have over 1000 reports per month. 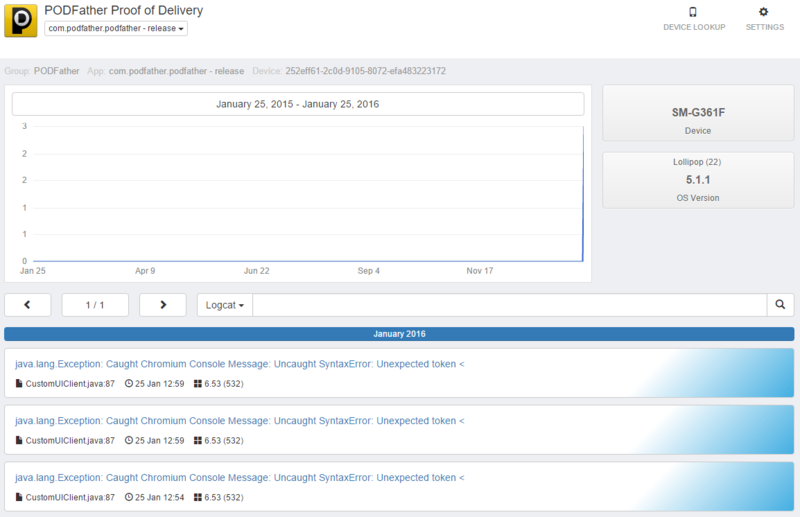 However, we can't afford to miss out on crash reports from old versions of our app, and if we switch to Tracepot from our current in-house acralyzer instance, we'll want it to be a clean break and not need to check two places for reports. As such, would it be possible for our Tracepot collector URL to accept reports which were actually made to the above URL, if we changed the DNS for OUR_SUBDOMAIN to point to collector.tracepot.com? If not, do you have any other suggestion for how we could make this work? Obviously we could release a new version of our app with the Tracepot collector formUri, but it takes more than 6 months for our new releases to filter down to all users and we can't afford to lost any reports. If anybody else need help with migration from Acralyzer let us know. Just hoping you'll provide a free option for opensource projects once you leave beta :). We have the Free plan. I does not contain ProGuard integration nor notifications and monthly limit is 1000 crash report received. You need to decide your self if its sufficient for you. We have several application variants used for development, and all of them are shown in the Dashboard forever, despite some of them are not used anymore, or do not have open issues. It would be nice to have a possibility to hide/group/rearrange them on the Dashboard. You can now delete groups and applications. 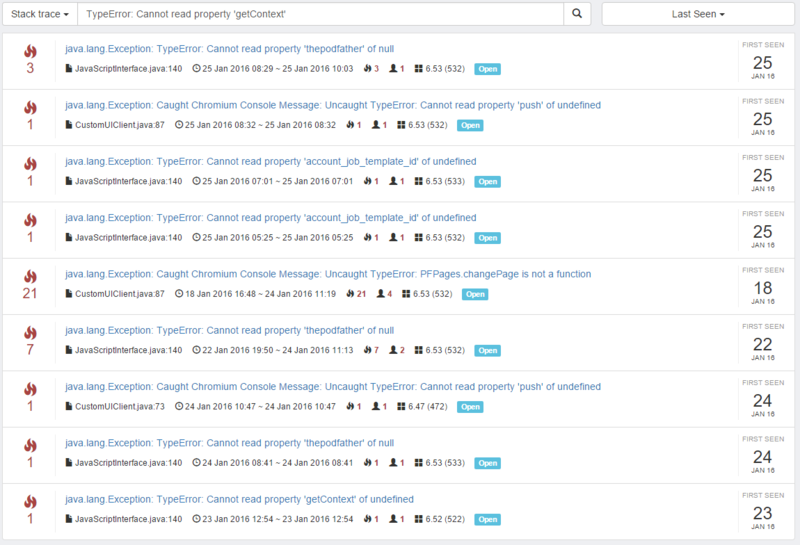 At present if I search for a string such as "TypeError: Cannot read property 'getContext'" using the Stack Trace filter, it seems to include results which contain ANY of the words I enter. I can't figure out a way to do an exact match, so I'm left hoping that one of the words in the error is unique enough that I can enter that word alone. Please make it possible to search for a full string, perhaps by enclosing it in "quote marks" or by adding a dropdown for search type. Additionally, if you do go down the route of adding a dropdown option it would be even more helpful to be able to match using regular expressions too! Hi, Tracepot does support all ACRA versions to date. If anything does not work for you as excepcted, please contact our customer support. First of all than you for this great site. I just started using it and I did have some problems at the beginning. What made things a little more confusing was that server was responding with "HTTP 200 OK" message. Okay I get that it's saying that the HTTP request itself was OK, but maybe other respond code could be used or at least more informative message. Or maybe something could be shown on Tracepot API front page saying "Invalid request received". We have a few thousand crash reports in Acralyzer which we would love to be able to import into Tracepot to kickstart us using the system and allow us to visualize how we will use it before we switch over our live apps. Is this something which would require major development? I've got sample CouchDB exports (JSON) which I could provide to show the kind of data format I'd be talking about, if that helps. Please send me a sample export so I can see the structure. I will know more after that. Perhaps I'm missing something obvious, but I can't seem to get the Device Lookup box to return anything useful. All of the above show nothing but the red "Device not found." popup. Any suggestions what I'm doing wrong, or how this feature is supposed to work? It might be wise to add a snippet of text above the "Android Id" field in the Device Lookup popup, explaining what this ID is supposed to be and where to find it. We added short explanation what Android ID means and where it can be found. In our team we colaborate on some projects but have our own projects. It would be nice share certain group with others so anyone could review tracelogs from their accout.